Wanted to share this. Parts of it remind me of the team and how we never give up..
What has been going on!!!! What a busy few weeks it has been here in Designing Dublin. We have completed our scheduled conversations, these took place in November. 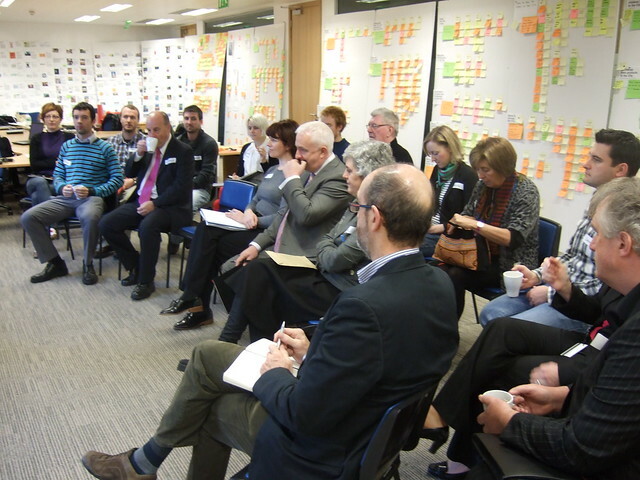 We invited stakeholders,businesses and individuals to take part in our themed processes. I worked on the theme of ” These Are The People Who Exchange Their Products In The City”. We had a great mix of people involved in our process. It helped me to learn more on running a process, being aware, inclusive and listening all at the same time. Hard work I can tell ya. It was really enjoyable to engage with people in this manner. How challenging do you find it to generate more footfall within the city centre? What do people love about the city?,What are people proud of in the City? 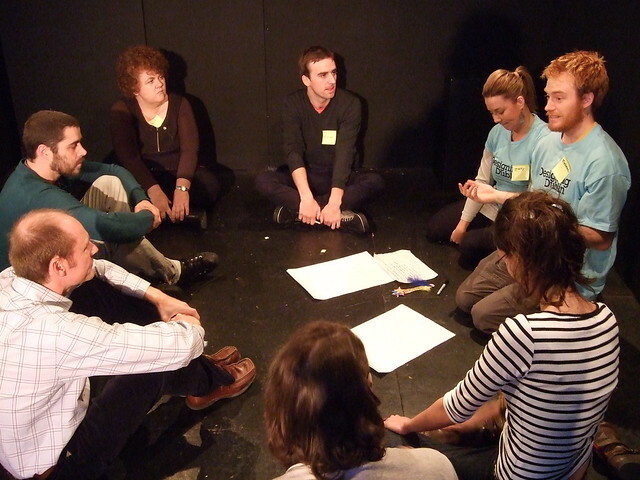 Where can I find out about events and activities around creative ideas?, If I want to suggest an idea for bringing people in the city together who should I talk to? Do you find there is much co-operation? Some of the challenges that came out of the process included: more interaction and communication between businesses and traders, transport, parking, clamping, how can the City bottle the magic and energy that one off events bring to city all year round e.g. “The city was alive on culture night can this be spread out over a year, it was fun not threatening”. How can local events link into the City Center to encourage footfall, networking,is there a way of doing this ” People embend their roots through the city e.g Culture,Shopping,Walking ,Personal. The reason why people come into the City can be explored by their roots in the City”. There were some positive outcomes also people thought that the City Centre was unique in the sense that it offers diversity and the shopper can do different things in the one space. Personal knowledge: traders / businesses have knowledge on what is in the City in terms of business and people if a customer is looking for something in particular they do not have they know where to send them to get it and they know the person they are sending them to.It was felt that this is unique to Dublin aswell. Meetings between traders are taking place in the City. After the scheduled conversations we then moved onto ”Innovation Dublin ” where we displayed our 100 Hidden Gems in the City. This took place in Film Base. The 100 Gems were gathered from our street engagement processes.We also put tags on the 100 Hidden Gems all over the city. It was a real success. It was really warming to see people coming into the exhibit and enjoying it. We will be displaying it again in the new year. We also displayed pictures of the people who we spoke to during our street converstations. As a team we went around the city and visited some of the hidden gems, there is so much to see in the City Centre. We are currently working on Mapping through GIS. We will use this tool to find an area in the City Centre where we will work in the new year for 3 months. I am very excited about this. I am looking forward to working in partnership with people at a local level and bringing about change in their Community working in this way can create powerful results. We will have our area selected by Christmas.The criteria we are using to select the area is based on the challenges that were collected from out street and scheduled conversations in November. We developed a process that was laid back,spontaneous, personal and friendly and we did this by being our fabulous selves. We spoke to teenagers on O’Connell Street ,The Spire ,Henry Street,The Central Bank, Stephans Green Shopping Centre, Georges Street Arcade, Stephans Green Park. The rain held us back on our second day although that did not stop us from walking the streets looking for them. On approach to the teenagers we explained: who we were and what we were doing. We asked them questions like: Where do you like to hang out in Dublin?, Whats not cool about Dublin?, Does Dublin care for teenagers?, Where in Dublin has the X-Factor for you? What I noticed from chatting to the teenagers is that: It was difficult for them to get their point out. I imagine this is because teenagers are not often asked for their opinion on issues/ topics that effect them and their City. What I would love to do is bring a group of young people into a space where we can talk openly and have time to explore with them. From the street conversations we had with the teenagers other issues emerged that could be looked at a wider level.They where respect,safety,stereotyping and transport. Another common theme that emerged was that they all wanted a space to be and to chill out with their friends a place where they can have a sense of ownership and control with the support of adults.I felt that the question around Does Dublin care for you? opened the young people up more but we also asked this near the end of the chat with them. A very powerful and open question as Why,Why,Why leads from it. The hidden gems for teenagers were very public , we did get some that where very specific to teenagers in terms of words, places to shelter and hang out. Iwas inspired from talking to so many friendly and open teenagers in the City, the street engagemnet developed my passion and empathy further for young people. We will engage with “These are the people who” through scheduled conversation’s,we will be inviting in a mix of: People, Businesses,Management and Organisations. The “100 Exciting Things You Did Not Know About Dublin” will be explored through street engagement. I choose to work on “These are people who”. This involved going back to the matrix and picking out who we wanted to talk to based on the mixture of 30 headings that we had under this theme for example Children and Youth in the city. We picked out stakeholders who have experience in the theme but we also want to create a space that would make for an interesting conversation so the mix also needed to be contrasting. I found it enjoyable ,difficult, frustrating,exhausting and a learning experience . We got there and I found it to be worthwhile when we got over the first couple of hurdles. The next stage is to get these people in a room and run the scheduled conversation’s. Meanwhile the street engagement will go ahead. The other half of the team have been working hard on thinking up innovative and creative ways to catch peoples attention. I look forward to being a part of this process. The information gathered from this work will mean that we will have more input,ideas and thoughts from the stakeholders, which is very important for going forward. In the middle of working on the above we also had to prepare for a visit from the Steering Committee. The purpose of their visit was for us to give them an overview and a taste of what we have been up to for the last five weeks. We also got to pick their brains to get information from them on the above task . It really helped to find out that we are on the right track and that the hard work we have been doing is worthwhile and useful. During the Development and running of our process. I realise that it has reignited my passion for theatre and how the Art can be used as a form of engagement to talk about and explore issues. This method can be used to work with both young people and adults. So much can come from working in this way: It helps people to let go and express themselves in a way that they may not have done before, it can build up peoples confidence and it can open doors to change the norm of looking at issues that we face in our society. Had a really busy and interesting week as always. Kristin & Paul worked with us on process work. This really helped us to identify and understand the meaning of a “Process” a simple yet complex word. Having them present for the 3 days really helped with the development and the implmentation of our processes. They are fountain of knowledge. Here is a piture of part of our creative process. Wanted to share these links, we had a really interesting Skype call during the week with the Kaos Pilots after which they kindly mailed us to share the following links.Which I found really interesting. Enjoy!!!! What I like about the above is that they are based on engagement with people from the ground up. They help to create awareness, change the mindset and develop ways of making change through various methods. In order to get a listing of our stake holders we had to go through a process called The Matrix.We started off lookign at Enterprise,Living and Movement in the city. To link all of these together we then looked at the following Enterprise,Management,Organisation and People. Under these themes we wrote out sub-headings that would match of these . For Organisations our Sub Headings included Media under this we had e.g. RTE,Independant,Metro: Youth: e.g. CDYSB,Forogie, ARK, Science: e.g. Botanic Gardens,Sustainable Energy Ireland,NSAI. And this process was used across all the themes all team members had input into what they thought would go under each heading. For People we changed the process slightly we wrote a small scenario’s about different people. Every member of the team developed a couple of people to write about. The stories varied from different people including: immigrants, youth,gay People, Divorcd,Single,Successfull . In our stories some people hated the city others loved it and some did not know how to use the city in terms of getting around the city and being aware of what was out there for them. The people and organsiation matrix were my favourite theme’s to work on. With people we got to act out our stories and they became more real and it helped the team members get into the process. At times I found this process to be frustrating ,confusing and fun. Leading on from this we developed groupings from each theme. We went through each theme indivually , each team member picked out a post it from the theme that they realted to or that that they thought woudl be a contrats to another group ,person,company or organisation that was on the borad e.g. Sinn Feinn & Age Action Ireland, Irish Wildlife & Community Gardens. We discussed if these fitted into the group and if they would be intrsting to statrt a dialogue with around the city to find out their opinions and views on the users within the city but also to ask “Why are people not coming into the city” and maybe ask” Why do people not want to leave the City Centre?” . We worked in groups to devlop question that we would ask each grouping that we identified in each of the themes the number of groups varied from 4-6 during this process we also found common themes that were comign up in the groups. I was in the people group, so the themes we found were Needs, Deflectors,Pride,Respect,passengers, living and movement. View more presentations from Mooney12. The 100 Examples were under Spirit,Society, Entrepreneurship,Storytelling. To come up with mu 100 Examples I used the notes I had taken from the talkers that we had in with us. That helped to wake the brain up in order to come up with examples. Then as I went into the headings I began to think more about what they meant to me on a personal level that helped to form my examples evern further. I went on my personal knowledge in terms of Community & Youth Work then I pushed myself to go beyond dublin and think on a national and global level. Litstening to the other team members present on Stroytelling and Spirit also helped to open up my mind and thought process even more. A learning for me was that we all have a differnt view on spirit .It can be: Attitdues,people,culture,spontaneous,individual,collective,groups,the future,architechture,memorary,carnival,colour,food,physical,moods and variety. The ideas were also under Spirit, Entrepreneurship,Spirit,Society,Interaction. For these ideas I started by writing the first idea that came into my head under the above headings to get the brainstorm going. On my home on the 83 bus I found that was when my ideas flowed I could sit and take in the city on my journey home. My ideas vary from theatre based, collective,information sharing,education.After getting my ideas onto the post its I went over them and took out the ideas that were very similar.